Observer Alan Snook Time of observation 06/08/2018 - 22:30 Object Comet 21P Giacobini-Zinner Observing location East Kent Equipment 0.5m Dobson-mounted Newtonian 8mm Ethos eyepiece x260 Looks like a comet, not just a fuzz ball. I estimate it is 8th magnitude. There is a non-stellar nucleus and the coma diameter is about 1 arc minute. The tail extends to the SW for 4 arc minutes. The coma is surrounded by a fainter halo. 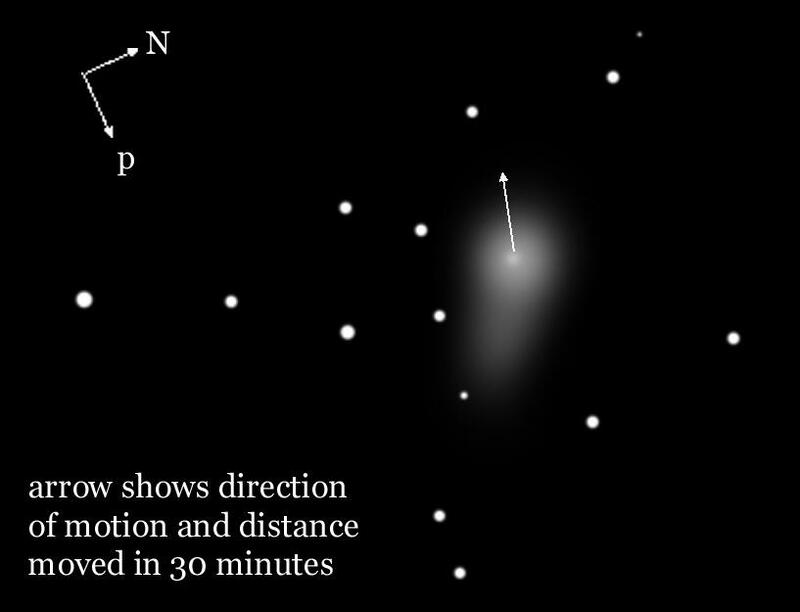 Several times I fancied I could see a short spike projecting from the nucleus in the direction of motion. I have not put this on the sketch. No colour was detected. Motion to the ENE was obvious. In 30 minutes it moved between 2 and 3 arc-minutes.